6-1/16 x 13/16 x 1/8 CT Planer Blades - Delta DJ-15, 37-154 - Set of 3. Product prices and availability are accurate as of 2019-04-24 00:23:29 EDT and are subject to change. Any price and availability information displayed on http://www.amazon.com/ at the time of purchase will apply to the purchase of this product. 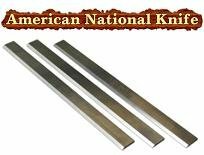 American National Knife has been producing professional quality woodworking knives for over 30 years. Our "in-stock" inventory of planer and jointer knives is one of the largest in America and ships the same day in most cases. Our knives are produced only from professional quality solid HSS steels and carbide.